This calligraphy was written by a student of Yoshimi, who also studies with another Calligraphy Sensei. Student said the meaning was to the extent of Endless Mind or Soul. She chose this one as the best work to frame. I had a difficult time with the Hada Urauchi....So unfortunately she will likely need to place the Hanko to the left of her Signature, which was unfortunate. The cloth has a slight Lotus Flower design, which made it appropriate for hanging in the Buddhist Monastery to which she is gifting the scroll. It is highlighted with a beautiful kurenai/Chairoi lacquer wood jikusaki that has gold fleck in it. This is a response from a customer along with my reply. I guess sometimes I get too hard on myself about seeing every little flaw and mistake. I have received the package today and I am very happy with the result. Maybe it is not “great” as you mentioned, but to my opinion it is at least very good! I gave it to my friend this evening and also he was very happy with it. Thank you very much for making this custom scroll. I am glad your friend is appreciative of the gift. Probably like yourself in Martial Arts I seek for perfection in my work, which sometimes hinders my ability to see the overall good and focus only on minor flaws. This custom designed handmade wallscroll went to the Seattle Tacoma area for a new dojo that is opening it's doors. If you would like to order a custom scroll there are three ways to get started: 1. Go to my shopping site at www.shop.customjapanesecalligraphy.com 2. Download my scroll design workbook from my website at www.customjapanesecalligraphy.com to read about the concepts behind kakejiku or wallscroll design. 3. E-mail to me directly at sales@customjapanesecalligraphy.com Banzenkan is written in Gyousho style. Banzen means perfection or flawlessness and kan is a meeting place or hall. Kouminkan is a public hall or gathering place. I used a dark gold Ichimonji with a karakusa pattern to make the dark brown cloth stand out. 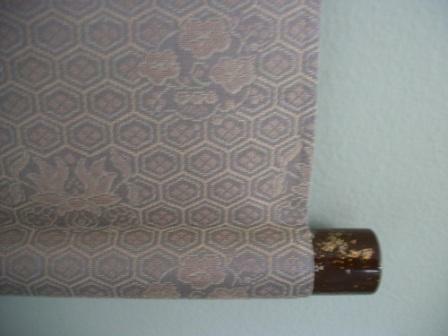 The scroll is completed with plastic Jikusaki and a dark gold Kakehimo. Hopefully the students will adhere to the dictum of the statement and try to attain perfection in their Martial Arts studies in this study hall. Scroll dimensions are given in Bun, and inches below. Writing was done by Ryugyoku, "Yoshimi Yamada Maples".